German and Soviet soldiers conversing, 22 September 1939. Battle of Poland: German forces under the command of General Heinz Guderian (XIX Corps) were in possession of territory on the eastern side of the Bug River. Soviet forces now arrived to assume control of that area under the secret terms of the 23 August 1939 Ribbentrop-Molotov Pact. 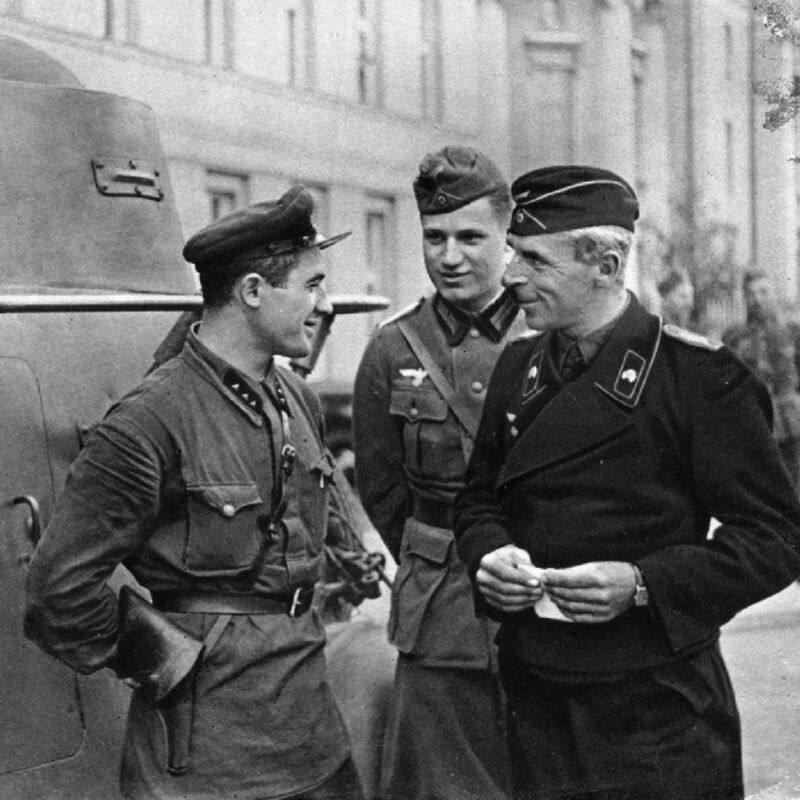 Kombrig (Commanding officer of the brigade) Semyon Moiseevich Krivoshein of the Soviet 29th Tank Brigade, who had crossed the Polish border on 17 September, reached Brest-Litovsk on the morning of 22 September. Krivoshein found the Germans looting the town, with Guderian himself ensconced there. The German apparently had been there for several days already. 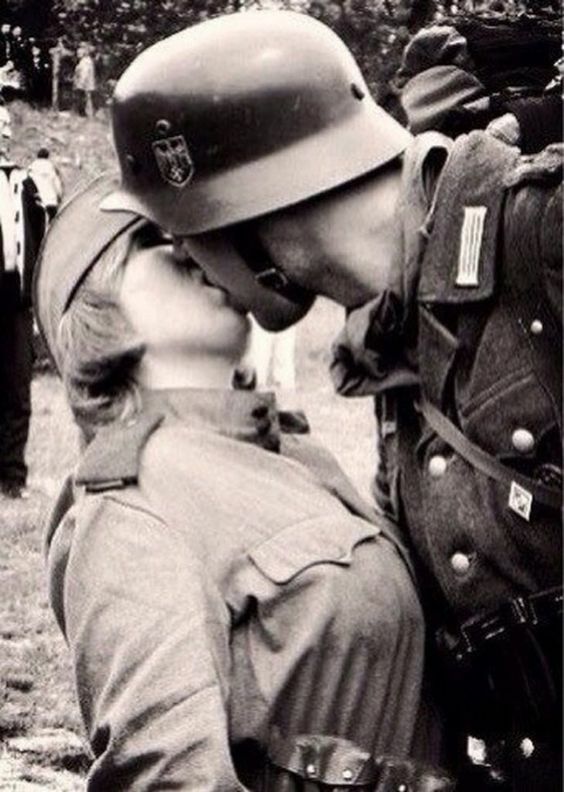 A Wehrmacht soldier kisses a Russian female soldier in Brest-Litovsk, Poland, 22 September 1939. 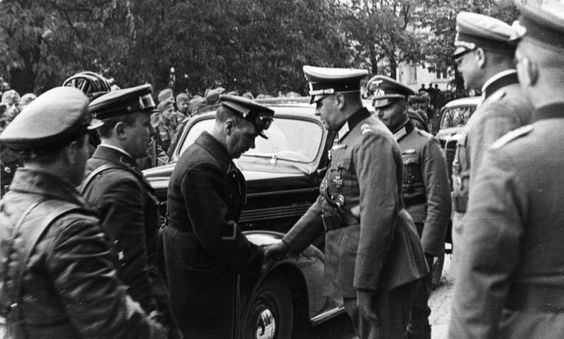 After some back-and-forth, Krivoshein visited Guderian at the latter's headquarters. Guderian acknowledged that he had to relinquish the town, but proposed to make the German departure a formal occasion, complete with parade. Krivoshein was not very enthusiastic about the idea, having just completed a quick advance to reach the city and not wanting any extra hassles. However, Krivoshein agreed to supply a few token battalions to support the effort, along with a military band. The informal parade began at 16:00, complete with festive bunting. Both German and Soviet troops marched through hastily constructed "Victory Arches" before the two commanding officers. Guderian and Krivoshein at the Brest-Litovsk parade. Krivoshein later greatly downplayed the event in his memoirs and implied that the Soviet forces were merely present and not active participants. He recalled that he did not allow his troops to march with the German forces, who were rested and looked more presentable. However, it should be noted that subsequent events made downplaying any cooperation with the Germans a politically wise decision, and Soviet military historical works are notorious for their impeccable political hindsight. Afterward, the German forces withdrew to the west bank of the Bug River as pre-ordained. The event has attracted much publicity in subsequent years due to the subsequent estrangement of the two forces. It is believed that the 22 September 1939 parade was the only such event that ever took place involving the two sides. Russian historians, in particular, are quick to minimize the event as being merely a "ceremonial departure" of the German forces, but the photographic record suggests that it was a bit more than that. The Polish commander of Lwów hands it over to the Soviets. Polish units of the 39th Infantry Division have been defending the village of Cześniki near Zamość. They have been holding off the German 27th Infantry Division and 4th Light Division. The 39th Infantry Division now is ordered to relieve Lwów and breaks through the German lines. With that city suddenly being surrendered, however, they are now on the move with nowhere to go. "Honorary Colonel of the 12th Artillery Regiment" Generaloberst Werner Thomas Ludwig Freiherr von Fritsch is killed in Praga while "inspecting the front." He is picked off by either a sniper or a machine gun. 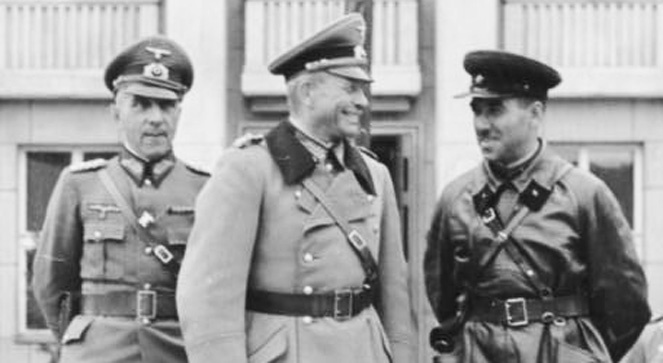 Von Fritsch is believed to have voluntarily exposed himself to enemy fire due to his lingering disgrace over the false accusations of homosexuality used to depose him from his position as Commander in Chief of the Heer. Western Front: The French claim to be approaching Zweibrücken in the Siegfried line. French radio also reports that the Wehrmacht has lost 150,000 men so far in the conflict. The actual figure is maybe 10% of that. Battle of the Atlantic: The steamer Arkleside is torpedoed and sinks. A Grimsby trawler also is sunk. Romanian Government: The government executes several members of the Iron Guard, including the assassins of the Romanian Prime Minister, in Bucharest. Allied Supreme Command: In Hove, Sussex, the second meeting of the Allied Supreme War Council takes place between the British and French representatives. Nothing much is accomplished beyond issues of supply. British Homefront: The Metropolitan Police Commission in London reports that road accidents have tripled so far in September. That is likely due to the blackout. The courts are clogged with blackout violations. Gasoline is rationed.